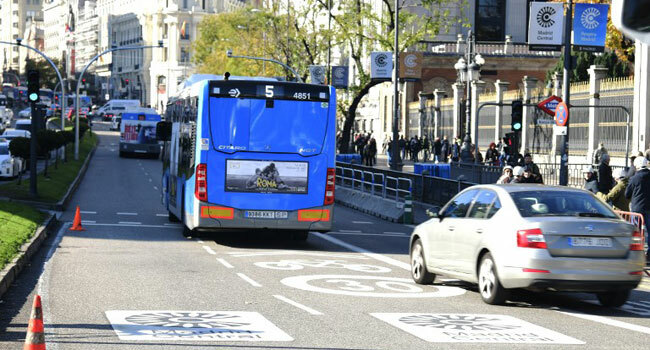 Madrid on Friday launched an ambitious traffic restriction scheme in the city centre with which it hopes to reduce gas emissions by 40 per cent, drawing mixed reactions. The “Madrid Central” system covers the Spanish capital’s historical centre and aims to “reduce pollution, noise and improve public spaces,” according to the left-wing city hall which points to the abundant offer of public transport and encourages cycling. Madrid follows in the steps of other European cities like London, Stockholm or Milan that have restricted traffic in their centres. In their case though, drivers can pay to enter. In the Spanish capital, on the other hand, many drivers are banned altogether from accessing the centre and will be fined if they do. Those who are allowed into the zone, marked off by a red line on the road, including residents, trucks carrying goods, taxis, buses, school, security and emergency vehicles. Electric or hybrid vehicles belonging to non-residents are also allowed in, and the rest can only enter if they park in a parking lot. Residents are also able to give out up to 20 invitations a month for people to enter without being fined. In its first phase until the end of the year, authorities won’t be fining anyone and police will only inform drivers whether they can or cannot go in. In January and February, people will start being notified of committing an offence, without having to pay a fine. And from March, drivers who go in illegally will be fined 90 euros ($102). Air pollution is a pressing issue in Madrid, where a murky cloud covers the capital on clear days. But for some shopkeepers, it’s not entirely good news. “They’re discriminating people according to their income levels,” said Fernando Ahumada, who owns a small cigarette shop in centre city. “If you’re rich, there’s no problem. You buy yourself an electric car and you move around, but if you’re poor, in your car, you die. Ahumada says he fears his business income may drop as fewer people come to the centre. But in the touristy, Las Letras district of Madrid, another shopkeeper, Juan Ramirez, supports the measure. “I think it’s necessary, because you walk around and there are cars everywhere, and the air is filthy,” he says.